Easy To Use – Mix, boil and pour! 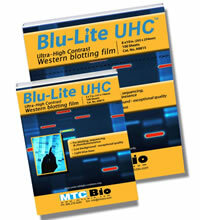 Blu-Lite UHC™ is our newest line of high contrast, high sensitivity autoradiography film. Blu-Lite UHC film is specially formulated for an optimized balance of high sensitivity and low background. This low background, high contrast formula produces a lighter blue film, making it ideal for all autoradiographic and electrophoretic applications. In addition to Blu-Lite UHC's excellent sensitivity and contrast characteristics, it is also coated on both sides (double emulsion) for improved consistency and overall performance. 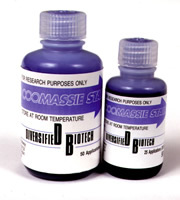 Especially useful with chemiluminescence, BluBlot™ HS works well with 14C, 32P, 125I, and 35S. 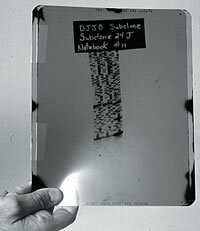 This new film reliably produces sharp images which allow for maximum DNA visualization with unsurpassed clarity. Compatible with automatic processors and manual development methods, Blu-Lite compares directly with films costing 3-5 times as much. With a shelf life of 2 years from date of production, Blu-Lite UHC is packaged in lined, light-safe dispenser boxes that include an improved "lift off" cover. Film is packaged 100 sheets per box. 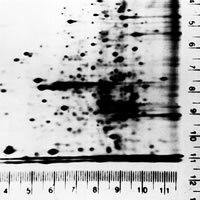 BluBlot™ is a high quality, highly sensitive film that is ideal for a wide range of electrophoretic and autoradiography applications. It can be used with a calcium tungstate or blue-emitting rare-earth screens. 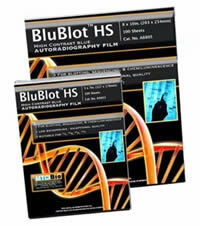 BluBlot HS exhibits excellent sensitivity and is coated on both sides for improved consistency and overall performance. It reliably produces sharp, bright images that are easily visualized and suitable for publication. Especially useful with chemiluminescence, BluBlot HS works well with 14C, 32P, 33P, 125I, and 35S. Compatible with automatic processors and manual development methods, Blu-Lite compares directly with films costing up to 3 times as much. With a shelf life of at least 18 months from date of production, BluBlot HS is packaged in lined, light-safe dispenser boxes of 100 sheets per box. At a price that makes them truly disposable, all sizes are engineered from crystal clear polystyrene (except for the opaque black that protects light sensitive samples). All sizes are also equipped with an easy-to-open hinged lid that reduces evaporation. 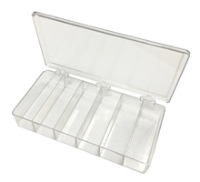 The new MultiBox™ 6 is made of exceptionally tough, crystal clear plastic and has six 32 x 100 mm compartments. 2⅞ x 1-3/16 x ¾"
2⅞ x 2 x 1¼"
3½ x 2-9/16 x 1"
3¾ x 1-3/16 x ⅝"
4⅜ x 2-1/16 x 1⅞"
4⅝ x 3½ x 1⅛"
4 ⅝ x 3 ½ x 1⅛"
4-9/16 x 4-9/16 x 1¼"
6 x 4 x 1¼"
6 x 4 x 2"
4¼ x 8¼ x 1⅜"
Ideally sized at 8.5" x 11" (216 mm x 279 mm). Thin sheet easily slides beneath a gel. Flexible sheets eliminates air bubbles. Protects the surface of transilluminators from cuts & scratches. Polyolefin composition allows acid washing and autoclaving without a chemical reaction. Optical densities for the 5 mil thick sheets at 254 and 300nm emission wavelengths of the transilluminator are 0.14 and 0.04 respectively. Versatile – phosphorescent, non-radioactive adhesive labels that may be cut to the specific size and shape needed for each individual membrane, dried gel or microarray. Fast and Easy – marking system is great for documentation and archiving and ideal for chemilluminescence and radiological autography (patented). Use an ordinary pen to mark the label using the investigator's own codes and symbols. Simply peel the custom label from its backing and affix it to the membrane, gel or microarray. Permanent – exposes a negative image of the markings directly. Glow Writer is a phosphorescent pen for marking chemiluminescent and isotope-labeled substrates for X-ray film autography. 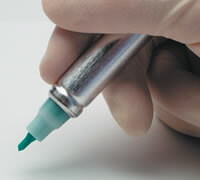 The unique marker delivers a phosphor-containing ink through a fine point porous nib. Before exposure to X-ray film, the phosphorescent writing is excited by room light. The pen utilizes a phosphor ink having an optimum concentration of phosphor and a relatively short afterglow half-life (approximately 2-3 minutes) has been selected so that upon exposure to X-ray film, autographic exposures of almost any duration will be easily readable on the film. The fine point nib is easily replaceable if it dries out. Protects – Place FlowMesh above or below a gel or filter to protect from tearing, bending or folding. 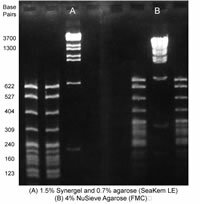 Sturdy – Supports gels during incubation with nucleic acid probes, antibody probes, equilibration buffers, stain, destain solutions, etc. Versatile – Use as a permeable spacer for stacking as well as for staining and destaining procedures. Access – Both sides of a container or plastic bag are assured of constant solution access, which improves the uniformity of hybridizations and binding assays. 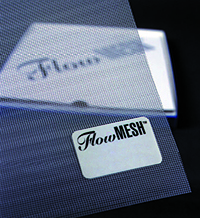 Convenient – FlowMesh is re-usable and easily cut to size. No more guesswork – Accurately measure the mobility of electrophoretic markers and ethidium bromide-DNA complexes during electrophoresis. 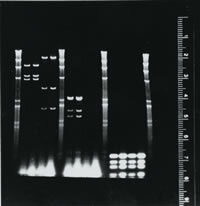 Thin – At 7mm wide they require only a single lane of an agarose gel. Fluorescent ink markings are sharp and photograph well under UV light (300 nm & 350 nm). Rulers are made of a flexible, UV-clear plastic so only the fluorescent markings will show under UV light. 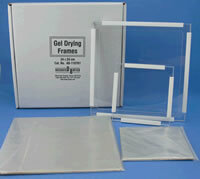 Gel Drying Frames allow researchers to quickly and easily dry gels between two sheets of cellophane without the use of expensive heat/vacuum gel dryers. The 24 x 24 cm frames allow for drying of larger format gels, while the 14 x 14 cm frames are ideal for mini gels and other smaller formats. The Autoradiography Ruler Set (ARS) is an orientation and measurement device that exposes metric ruler markings directly onto X-ray film.